Milo is a nutritious chocolaty drink made from malted barley that the whole family loves. Milo is packed full of energy and contains minerals and vitamins including iron, calcium, vitamins A, vitamins B1 and vitamins C which are needed as part of a healthy and balanced diet. Extract of Malted Barley (16%) or Malt Barley and Rice (total extract 35%), Milk Solids, Sugar, Cocoa, Minerals (Calcium, Iron), Maltodextrin (Corn), Vitamins (C, B3, A, B6, D, B2, B12), Emulsifier (Soy Lecithin). This stuff is great for your kids, a cold glass in the morning and it keeps them active throughout the day. Then after a cold day, you can come in for a nice mug of hot milo to sooth and caress your bodies senses. Nestle Milo is the best drink i have ever had hot cold and on icecream you can also eat it as chocolate off the spoon! It's fantastic, I am addicted! 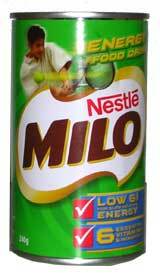 Nothing beats a cold Milo on a hot day or a hot Milo on a cold night!!! Or sprinkled on icecream.. or just as is with a spoon :) Best product ever! !